When you've got that one model you just can't find the right sized base for, you can make you own with a little bit of work. Alright, I lied, with a lot of work. 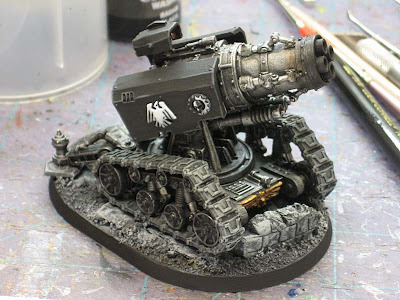 But then again, if you've got a model that needs a "custom sized base," you're probably willing to invest the work into the base since you most likely have agood bit of time invested in the model itself. There are tons of base providers out there and with a little bit of hunting, you may be able to save yourself some work. Now resin bases may not be right for everyone and there a discussion about that in this post here. There are three simple questions you can ask yourself to see if you're ready to go that route. But... in the event you can't find the size you really want, there is the option of building it yourself. Or maybe you're just unlucky like me and always seem to end up needing odd sized bases. 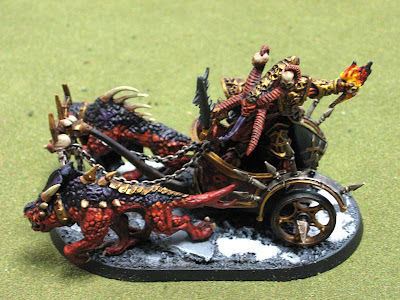 I've actually had to do this twice now, once for a custom Skulltaker model and once for a base for a Thunderfire cannon. You can see the Skulltaker project in it's entirety here. You can see the Thunderfire project posts here. You'll need a few things (in addition to lots of patience) to get this one done right. Believe me though, it's definitely worth it in the end. It may take a good bit of work, but the results can't be beat. And besides, it protects your model in the end and what more could you ask for? The first step is to find the center of your round base. Finding the center can be tough until you flip the base over and find the series of holes that run in a straight line across the base. With GW bases, these line up perfectly with the center of the base. All you do is drill a small hole through the center hole, flip the base over and cut the base in half making sure your cut passes through the hole you just made. 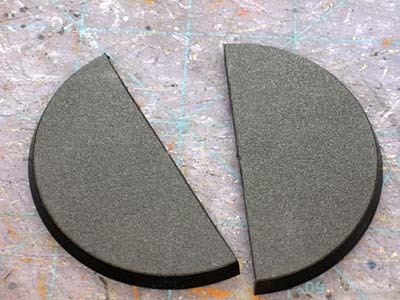 With your round base cut in half, clean up your edges so they are flat and smooth and set it aside for now. 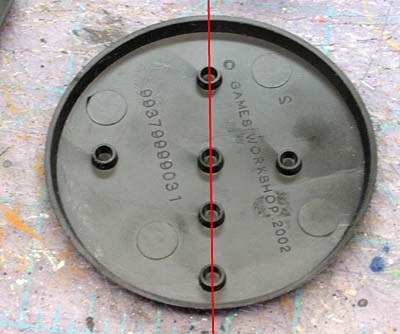 If you look at the height of the 25mm square bases and the height of the 60mm round, you'll notice the round base is slightly higher than the square ones. We'll need our plasticard to fix the height difference. For plasticard, I'm using a plastic yard sale sign I picked up from a local home improvement store. It's the perfect thickness to make up the difference in height. 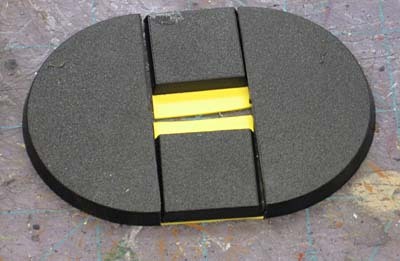 You'll want to glue a small piece of plasticard to the underside of each square base. 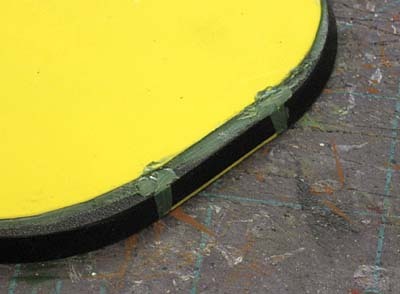 You might want to rough up your surfaces as well (ever so slightly) so the superglue will bond to the plastic better. You can cut the sides of the squares flush, but the one side of the square that will be facing out will need to have a beveled cut to it. That means you need to cut it at an angle and NOT hold the blade straight up and down. 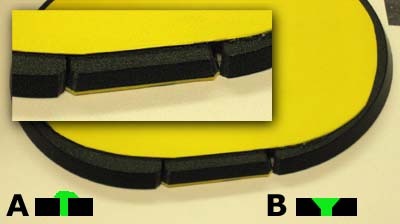 The reason for this is that you are trying to match the same angle as the side of the base itself. If you were to just cut it normally, you'd be able to tell you added the plasticard "spacer" when you were done... and we don't want that. With all of our pieces cut to fit, we test the base out. Assemble it all and make sure there are no glaring problems. 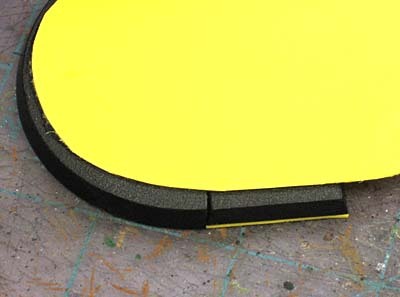 Now you'll want to make a plasticard pad for the top of the base. This will hold it all together and needs to be slightly smaller that the actual outer edge of the base itself. 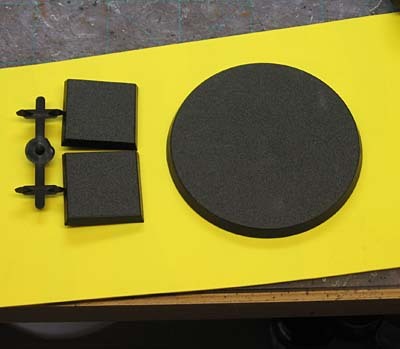 Take the plasticard pad and start at one end and glue a round half down. Then one of the side pieces followed by the other half round and then the last side piece. As you glue the pieces down, make sure to dry fit them so you don't end up with any excess space on the last side or things don't line up correctly. It will take some patience and careful gluing to get all the pieces assembled correctly. Once you get it assembled, set it aside and let it dry well enough before continuing work. The next part is the toughest. With our base pretty much built, it's time to go in and greenstuff our joints to make it look like one solid base. 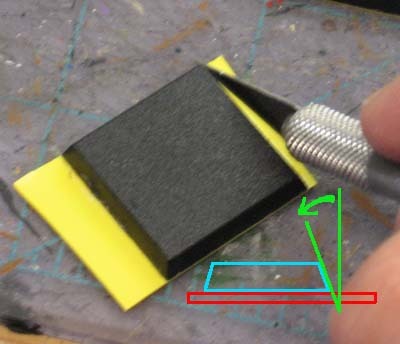 To do this well, we need to go in and cut notches between our square bases and round halves. Why you ask? Because when we go to greenstuff those joints, if we leave them as they are (Example A) it will be very difficult to get out greenstuff to fill the gap perfectly and make seamless blend. By cutting the corners out (Example B) we make so that we can feather the greenstuff and make the transition smooth and seamless. When it comes time to greenstuff the actual joints, I go heavy with my application and then go back and use a file to carefully trim down the excess until I have a perfect transition between the pieces and there is no indication of it being a bunch of smaller bases that make up the one larger one. I also go in and add a small bead of greenstuff along the edge of the plasticard pad that sits on top just to remove the slight lip it can create. 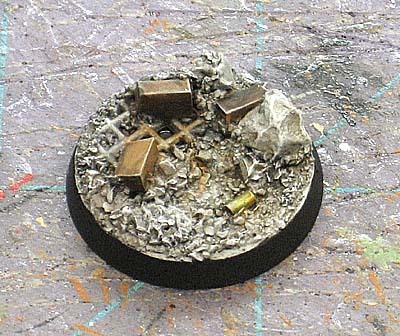 This is not so important if you are using a thick/heavy basing material that will be covering it up in the end, but if you're using something thinner, you might want to take this extra step just to be sure. 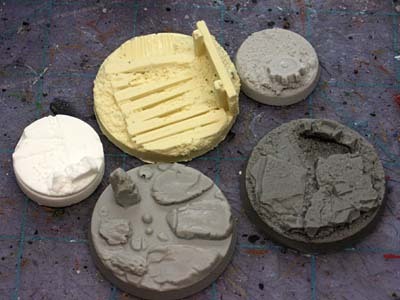 I've got a simple post on using free basing materials here and a followup post on using some higher quality materials for more control that you can read here. This is one of those problems that just crops up sometimes eh? Nice tutorial. But wouldn't it be better to use brown stuff in stead of green stuff for this, since brown stuff can be sanded smooth after it dries? GDMNW: Doesn't everyone have these problems... or am I the only one? Brothers Grimm: I've never used brown stuff. The greenstuff I used here I went a little heavy with the blue, maybe 60/40 (for harder results) and didn't have any trouble at all sanding it to a smooth surface with a hobby file.